The small northwestern Syrian town of Kassab, located directly on the Syrian-Turkish border, has turned into a pivotal battleground between Syrian security forces and armed militants backed by the Turkish military. The clashes grabbed headlines last Sunday when Turkey shot down a Syrian warplane conducting airstrikes along the border as the militants crossed over into Syrian territory. A Turkish F-16 fired a rocket at the Syrian jet and it crashed around 1,200 meters (1,300 yards) inside Syrian territory. Clearly the Turkish government knew Syrian forces were engaging militants Ankara itself was harboring in its territory and any cross-border pursuits carried out by Syria posed no threat to the security of Turkey any more than the cross-boarder pursuits the Turkish government regularly conducts in northern Iraq against Kurdish militants. 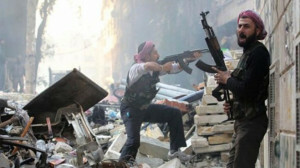 Instead, it appears that Turkish warplanes were in fact providing air cover for the militants crossing over into Syria. When hardline Islamist rebels took over swaths of Latakia province this week, it provided them with their first outpost on the Mediterranean Sea. The military offensive was symbolic for several reasons: rebels from al Nusra Front taking over northern parts of Bashar al Assad’s hometown province while the Turkish air force shot down a regime war plane trying to bombard the rebel advancement, as it flew near their shared border. Nusra is al Qaeda’s sanctioned offshoot in Syria. A NATO member providing air support for Al Qaeda incursions into a neighboring country could not be a more egregious violation of national sovereignty or international law. Yet Turkey has apparently not stopped there in seeking to escalate tensions with Syria. A recently leaked conversation between the head of Turkish intelligence, Hakan Fidan, and Turkish Foreign Minister, Ahmet Davutoğlu, reveals Turkey’s plans to stage a false flag attack on Turkey itself to provoke war with Syria. The astounding revelation has been all but buried by the Western media who has instead intentionally focused solely on Turkey’s banning of Facebook and Twitter to cover up what it only refers to as “corruption.” Turkey’s use of a self-inflicted attack to justify direct military involvement in Syria risks triggering a greater regional conflict involving Turkey and by extension, NATO’s primarily Western membership – a scenario the West has been seeking almost as soon as the conflict in Syria first started in 2011. 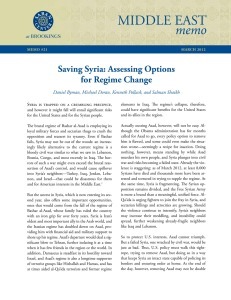 Western intervention, even if limited in the north of Syria via Turkey, would allow for the creation of Western occupied “buffer zones” within Syrian territory, long desired by the West since at least as early as 2012 by US policy makers, particularly those among the corporate-funded Brookings Institution from which many of America’s military adventures have been designed. Aiding and abetting Al Qaeda, providing armed terrorists with air support, and planning to intentionally provoke a war with Syria through a premeditated, self-inflicted and now fully revealed attack designed to frame Damascus – all carried out in plain view as the world looks on illustrates the dangerous desperation the West now finds itself in as its designs for global hegemony take a turn for the worse. While Turkey stands to take the fall for the recent and blatant serial acts of war against neighboring Syria, its membership in NATO and NATO’s subsequent failure to condemn Turkey for its actions implicates the entire military alliance as complicit. Ironic indeed is the fact that while NATO coddles, arms, and provides air cover for Al Qaeda along the Syrian-Turkish border, it uses the presence of Al Qaeda in Afghanistan to justify its continued occupation there as well as cross-border raids into neighboring Pakistan. At each pivotal juncture during the ongoing Syrian conflict, the West has expended heavily its credibility and reputation while straining the “international norms” it has worked for decades to establish. As the West fails at each of these junctures, the momentum it had relied upon so heavily starting in 2011 is further diminished. The battle in Kassab, and the lesser mentioned “Southern Front” along the southern Syrian-Jordanian border that appears to have already collapsed under Syrian counterattacks, appears to be the last battle by NATO and its proxies for Syria. Syria’s military appears fully capable of stopping the militants flowing over its borders and has exhibited infinite patience against NATO’s provocations. With Turkey revealed to be planning attacks on its own territory to provoke war with Syria, any attempt to actually carry out a false flag attack now would only further weaken both Turkey and NATO’s hand. Even if the West was able to establish “buffer zones” in northern Syria, the price they pay in credibility, reputation, and legitimacy would make any such “victory” Pyrrhic. As with all empires throughout human history, there is a defining moment when decline becomes irreversible and the demise of an empire imminent. For “Pax Americana” and the elite sitting on Wall Street and in the City of London, that moment might be the Battle for Kassab and the ignominious end of the West’s attempted regime change in Syria.